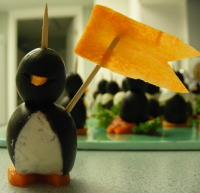 See PartyPenguins.net for more ideas!! 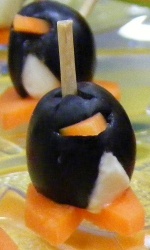 We have a lot of fun with these appetizers made from olives, cream cheese and carrots. They’re always a hit at parties! Some people think they’re too cute to eat but we think they are delicious. Originally from AllRecipes.com. The recipe and decoration ideas are below. You may also like the printable version of the recipe at LickYourPlateClean.com. The cream cheese mixture in the recipe below is enough to fill 50 colossal olives, so if you’re making a smaller batch, you’ll have some cheese left over. We like to put the extra into celery sticks, for people who don’t like olives. Mix the spices into the softened cheese; put the cheese mixture into a pastry bag or a plastic bag with the corner snipped off. For the body, select a jumbo olive. If it doesn’t sit straight, slice a bit off the hole end so it sits nicely. Cut a slit from top to bottom, lengthwise, into the side of each jumbo olive. If you want a big white area for the belly, cut a 1/4 inch wedge out of the olive. Carefully insert about 1 teaspoon of cream cheese into each olive; smooth with a spatula or butter knife. 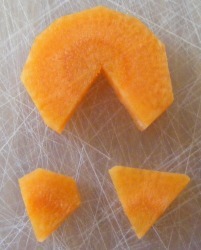 Slice the carrot into 1/4 inch thick rounds; cut a small notch out of each carrot slice to form feet. Save the cut out piece for the beaks. To make the beaks thin enough so they don’t break the small olives, slice the beak pieces in two, so they are half as thick. You’ll have plenty of pieces for this, so if they don’t all come out, it’s OK. To make the head, cut a slit in a small olive and insert the beak. If the beak is too wide, cut off a little bit of the wide corners (see example below). Set a big olive, large hole side down, onto a carrot slice. Then, set the head, hole side down, onto the large olive, adjusting so that the beak, cream cheese chest and notch in the carrot slice line up. Secure with a toothpick. Some people like to use frilly toothpicks for a more festive look. We like to dress our penguins to match the occasion. 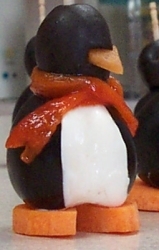 We’ve made Super Bowl Penguins, Halloween penguins, Christmas Penguins, and a big batch for a “Black and Gold” themed party where we used roasted yellow peppers for scarves and ties. 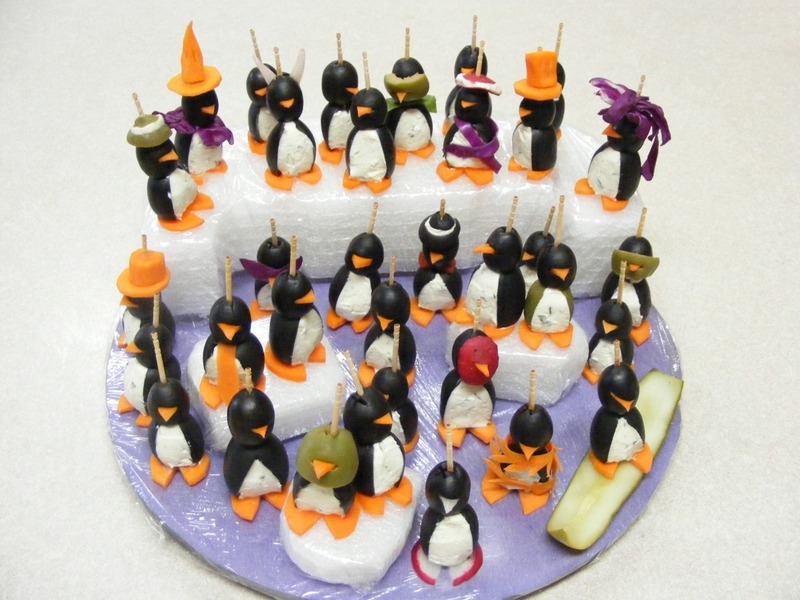 Lots of different veggies can be used to dress up your party penguins. To make scarves, cut roasted red peppers into strips about 5-6″ long and 1/4″ wide. Wrap them around the necks of the penguins you wish to keep warm. Using a vegetable peeler, make a strip of carrot about 2″ long. Trim one end to a point like a tie, and cut the other end straight across. Use a toothpick to pre-drill a hole through the flat end, so the toothpick goes through more easily when you’re putting the penguin together. As you are assembling, lay the tie between the body and the head, making sure the toothpick goes through the hole in the tie. This hat is fashioned from a carrot slice and part of the left over narrow end of the carrot used to make the feet. A stovepipe hat would be about 3/4″ of carrot. For a top hat, use about 1/2″ of carrot. 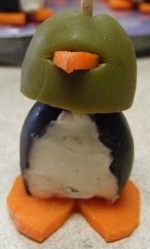 Put the hat on the toothpick before assembling the rest of penguin. It can be a little tough getting the toothpick through all that carrot; be careful not to break the toothpick! The hat was made with a slice of the hole end of a colossal olive, and the tip of a small olive, with a spurt of cheese in between. The tie is a rectangular bit of roasted red pepper (about 3/4″ by 1/4″) inserted between the body and the head. Using a vegetable peeler, make a long strip of carrot. 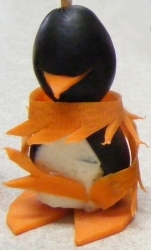 Cut diagonal slashes down one half of the strip; wrap around a penguin you wish to make classy and sophisticated. One of our favorites! It was his Halloween costume. We used part of a green olive for his head. The hat was made with a slice of carrot and a hunk of carrot whittled to a point. The ruffled collar is red cabbage. 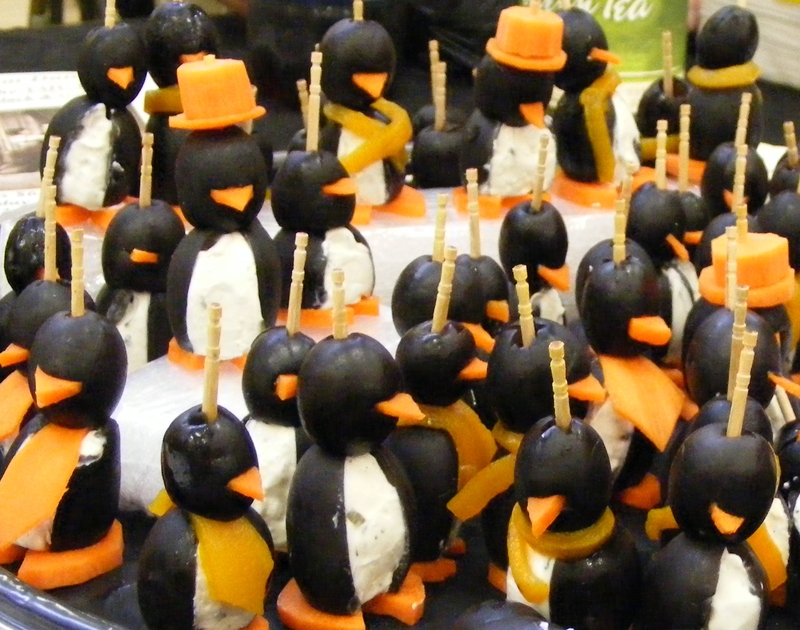 Put the hat on the toothpick before assembling the rest of penguin. It can be a little tough getting the toothpick through all that carrot; be careful not to break the toothpick! During assembly, lay the cabbage on the body before placing the head. You may want to use a toothpick to pre-drill a hole in the cabbage so it doesn’t squish the body as you put the toothpick through. To make the shoulder pads, slit a cocktail onion and spread it open. To avoid squishing the body, put the toothpick through the body and feet, then slide the onion onto the toothpick. Then put the head on. Using a vegetable peeler, shave a strip of carrot about 1/2″ wide, more if you can. Cut it into a flag or pennant shape and thread onto a toothpick, taking care not to split the carrot. Use a small olive on a set of smaller feet. Trim the hole end and cut a small V into the lower half of the olive. Fill with cream cheese and insert beak. Cut toothpicks in half and secure the babies to their feet. 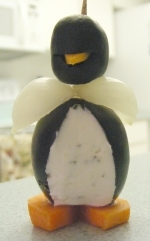 Here’s an idea for Easter Penguins… make ears out of radishes and give each penguin a dot of cream cheese for a bunny tail. You’d have to move the body forward on the feet some, so there’s room for the tail on the back. You could also make carrot and radish flowers on the ends of toothpicks and lay those around. They could be served on a bed of easter basket grass! For a New Years party, you could make a baby penguin with a tiny carrot top hat, and you could put a cream cheese beard for the outgoing year penguin, along with a carrot sash. Perhaps a sash could even be fashioned for the baby new year from a creatively-cut sweet wax pepper. Hmm! Over on AllRecipes, people have all kinds of ways they’ve arranged the penguins. I like the idea of cutting some foam board into icebergs, covering the foam board with plastic wrap and setting the penguins on them. This way, you could poke the toothpicks through the penguin into the foam, and your transportation problems are over! Just cover them with more plastic wrap and you’re good to go. We’ve also toyed with the idea of fashioning icebergs out of blocks of ice. For the Halloween party, we cut and plastic-wrapped some pieces of styrofoam packing material we had around and covered the serving plate with blue construction paper. 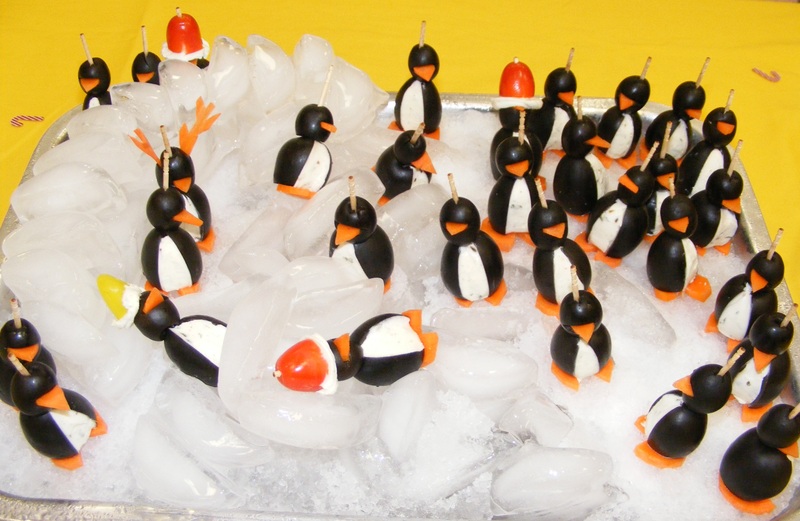 When we made the Christmas 2010 batch of penguins, we took a big block of conjoined ice cubes from our freezer, put them in a pan with more ice cubes and water, and froze the whole thing. Then I ground up some ice in the food processor and spread the resulting snow over top of the ice. That worked out well for a nice cold place for the penguins to stand. Not that they lasted very long! Next time, I will make more snow and fashion it into icebergs for the penguins to stand on. Ice cube bergs are too slippery – hence, the fallen penguins in the display below! This has always been a problem for us, trying to figure out how best to get the penguins to the party. They tend to fall over, and they haven’t even had a drink yet! Some ideas… a grid of rubber bands on a small baking dish. Egg cartons (they would probably have to kind of lean over, though). What else? Suggestions welcome. I came up with something good for transportation!! I saved the tray from a box of Cella’s chocolate covered cherries, and the penguins nested right in the tray and didn’t fall over. Some of them had feet that were too large, but putting them in egg cartons worked OK… not great but at least they didn’t fall into each other too much. 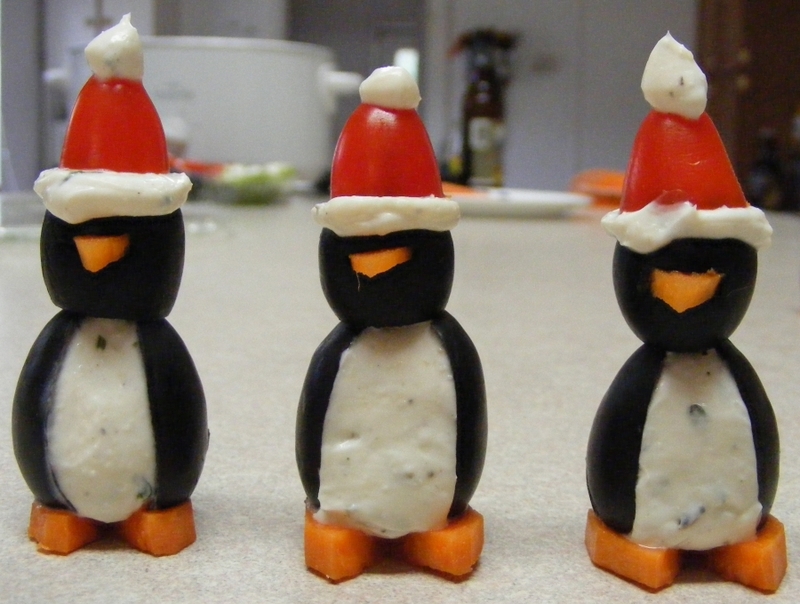 The other day I was looking for ideas for dressing up the penguins and found these Cheese Snowmen. I like the olive top hat! Also neat are these egg penguins! One of these days, when the occasion calls for it, I’ll make an igloo like this one. Thank you for the cute peneguin appt idea. I posted your idea on my pinterst page and gave you the credit. I will try to post my pictures once I have them done. To transport have you tried egg crate boxes or cupcake trays? Egg cartons work great!! They are just the right size to keep the penguins standing up, they stack well, and it makes transporting them very easy. I haven’t updated this page in quite a while… everything is now at https://partypenguins.net. Emily, I love your ideas! I have been making these for years, but I love your spin on them. I have a question, though…the ones with the “Santa hats”…what are the hats made of? Are they cherry tomatoes? It’s difficult to tell. Hi Jason. Thank you! The hats are grape tomatoes, cut in half, scooped out, and dried. See Party Penguins – Christmas for all the details! I love all these penguins. Thanks, Dot! I’ve updated the link. I used mini muffin tins (24 spaces per tin) for transporting. Impressive… and incidentally, a Linux-related funny theme.